Fiji’s Olympic football team are ramping up their preparations for the Rio Games with a four-match tour of Brazil.Fiji’s Olympic football team are ramping up their preparations for the Rio Games with a four-match tour of Brazil. The 22-member squad flew out to South America yesterday to get an early taste of what to expect when the Olympics get underway in 100 days. National team coach Frank Farina says his side will face some quality opposition in the next fortnight. “We are looking at playing four matches there and we know all teams in Brazil are very strong. “Football is religion in Brazil and playing any team will be like playing their national team,” Farina says. 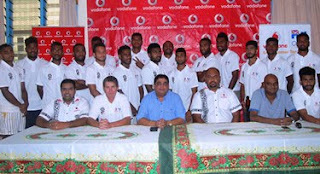 The Fiji coach said his players were looking forward to testing themselves against some tough opposition. “We will play two matches against Atletico Paranaense which qualified for Copa Libertadores last year. “We also have a game against Club Figueirense which has three players from the Brazil national U-20 team and Clube Parana which is second in their State competition,” he says. The matches in Brazil follow a six-game tour of Spain in January and Farina believes these trips are providing his players with invaluable experience. “The boys will get more exposure because they have learnt a lot from their Spain tour. Countries like Spain and Brazil are where people live and breathe football,” Farina says. The Fijians will make their Olympic football debut against South Korea on 4 August before taking on defending champions Mexico three days later. Their final group match will be against European heavyweights Germany on 10 August.